If you’d asked me about this photograph a few years ago, I might said that Joachim and Sophia were, in fact, Ernst and Friederike. That is, I might never have identified the couple in this cabinet card photograph if it weren’t for a few subtle clues that pointed me conclusively in the direction of one immigrant couple over another. My grandmother’s paternal grandparents both came to America as infants, the son and daughter of Pomeranians from the region now known as Mecklenburg-Vorpommern, Germany. The first couple to reach America, Joachim and Sophia (Cammin) Wiese, traveled from Hamburg in 1868.1 The second couple, Ernst and Friederike (Wagner) Stübe, traveled from Hamburg in 1869.2 Both couples settled initially in Chicago, although within a few years, Ernst and Friederike would move to a rural community outside the city. 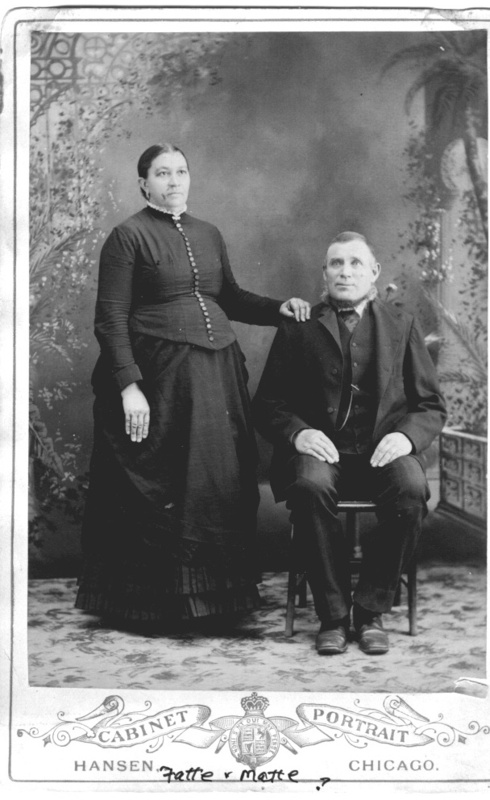 The couples were born within several years of each other, and no other identified photographs of either couple existed in my collection in order to aid in their identification. Based on the provenance of this photograph in a family collection, I knew that it must show one of these two couples. Joachim and Sophia (Cammin) Wiese, ca. 1885-1890, Chicago, Cook, Illinois; digital image ca. 2000. The man and woman in this photograph are perhaps in their mid-fifties, give or take a decade. The photograph itself, taken by an unidentified Hansen of Chicago, is a cabinet card, a style that became popular after the Civil War.3 This, of course, fits the time period in which the Wieses and Stübes would have lived in Chicago. However, as both couples were only around thirty years of age in 1870, this photograph was more likely taken at some point between 1880 and 1900. The man is clean-shaven except for a trimmed neckbeard, and his hair is brushed away from his face. He has light-colored eyes – blue or green – and wears a typical three-piece suit. The age of the couple in this photograph as well as their style of dress suggest that, if this photograph was taken to mark a particular occasion, it may have been to commemorate an event such as their twenty-fifth anniversary. Joachim and Sophia would have celebrated their twenty-fifth anniversary circa 1890, a date calculated based on their ages and the birthdate of their eldest known child.5 Ernst and Friederike, however, did not reach such a milestone; Ernst died in 1879 at the age of forty.6 As the woman’s clothing in particular is markedly different from the styles of the 1870s, this photograph could not have been taken before 1879, and thus cannot be a photograph of Ernst and Friederike (Wagner) Stübe. A final clue comes from the notation penned at the bottom of the cabinet card by a descendant: “Fatte + Matte?”7 A letter written by the granddaughter-in-law of Joachim and Sophia noted that his grandsons could not recall their names, but had called them “Fatta” and “Mota.”8 Coincidence? I don’t think so. My hunch is that these are phonetic spellings of perhaps an old dialect-based variation of the German words for father and mother, Vater and Mutter. This is how Joachim and Sophia (Cammin) Wiese were remembered by their children and grandchildren. 2 “New York, Passenger Lists, 1820-1957,” digital images, Ancestry.com (http://www.ancestry.com : accessed 1 October 2013), manifest, S.S. Silesia, Hamburg, Germany to New York, arriving 12 October 1869, Ernst Stübe; citing National Archives microfilm M237, roll 319. 3 Georgen Gilliam Charnes, “Cartes-de-Visite: The First Pocket Photographs,” Nantucket Historical Association, 2004 (http://www.nha.org/history/keepinghistory/KHcdv.htm : accessed 1 November 2013). 4 Joan Severa, Dressed for the Photographer: Ordinary Americans and Fashion, 1840-1900 (Kent, Ohio: Kent State University Press, 1997), 419, 424, and 427. 5 “Hamburg Passagierlisten, 1850-1934,” digital images, Ancestry.com (http://www.ancestry.com : accessed 13 July 2014), manifest, Electric, Hamburg to New York, leaving 1 November 1868, Fritz Wiese; citing Bestand [inventory no.] 373-7I, VIII, A1 (Auswanderungsamt I [Emigration List – Indirect]), Band [vol.] 022; Staatsarchiv Hamburg microfilm series K1701-K2008, S13116-S13183, and S17363-S17383. 6 Find A Grave, Inc., Find A Grave, digital image (http://www.findagrave.com : accessed 1 October 2013), photograph, Ernst Stube (1839-1879), Memorial No. 67992204, Huntley Cemetery, Huntley, Illinois; photograph by Zavada Family. 7 Photograph of Joachim and Sophia (Cammin) Wiese, ca. 1890, Chicago, Cook, Illinois; digital image ca. 2000. The notation on the original photograph is believed to have been made by the late Lois (Wiese) Smith, great-granddaughter of the couple. 8 Louise (née Nelson) Wiese to Phyllis (née Wiese) Adam, letter, 2 April 1964, providing information about the family tree; Adam Family; privately held by Melanie Frick. Louise married Oliver Wiese, a grandson of Joachim and Sophia (Cammin) Wiese; Oliver had been acquainted with his grandparents as a child. This entry was posted in Photograph Analysis and tagged 1880s, antique photograph, cabinet card, Chicago, Germany, Illinois, immigrants, Pomerania, Stübe, vintage photograph, Wiese on July 16, 2015 by Melanie Frick.